Brandon Wardell is a comedian. 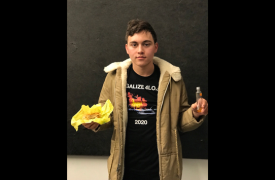 Brandon Wardell started doing stand-up comedy in DC at 17, did it for 4 years, then moved to LA in 2014. Brandon Wardell has appeared on Comedy Central’s “@midnight,” “The Meltdown with Jonah and Kumail,” “The High Court with Doug Benson,” and “Adam Devine’s House Party” and VICELAND’s “Flophouse". Brandon Wardell hosts “Hot Takes with Brandon Wardell” on Comedy Central Digital. Brandon Wardell is a correspondent on MTV’s “Wonderland”. Brandon Wardell was featured as the Hot Comedian on Rolling Stone’s 2016 Hot List. Brandon Wardell throws a monthly party called Teen Party at Los Globos in Los Angeles, CA where he aux cord DJs. Brandon Wardell is featured on Bob Odenkirk’s stand-up comedy album, “Amateur Hour,” and the two later went on tour. Brandon Wardell also went on select tour dates on Bo Burnham’s Make Happy Tour.